Iran, IAEA Ink Agreement, But Was Slain Deputy Minister Part of P5+1 Negotiations? Despite the near-miss over the weekend of an agreement between Iran and the P5+1 group of countries aimed at diffusing the crisis over Iran’s nuclear technology, an agreement was announced today in Tehran between Iran and the IAEA. The text of the agreement and its annex is quite short. Significantly, it grants access to and monitoring of the new heavy water reactor at Arak and to a uranium mine that has recently started producing yellowcake. The Arak reactor is important because it was seen as one of the major sticking points in the P5+1 talks. Reactors of this type produce large amounts of plutonium that can be reprocessed into a nuclear weapon. France appeared to be insisting that this plant not begin operations. However, even those who accuse Iran of seeking to develop a nuclear weapon readily admit that Iran does not have the equipment or technology required for reprocessing spent fuel from this reactor into weapons-grade plutonium. Iran explains that this reactor is meant to take over for the aging Tehran research reactor in production of radioactive isotopes for medical applications. Presumably, IAEA monitoring of the reactor would be to confirm this process and to track the materials produced as they are shipped to hospitals for use in imaging and treatment. Amano, for his part, described the signing of the joint statement as “an important step forward,” adding that more work needed to be done. “Under the framework of cooperation, Iran and the IAEA will cooperate further with respect to verification activities to be undertaken by the IAEA to resolve all present and past issues,” Amano said. There is no way that Amano would be talking of resolving “all present and past issues” if he didn’t believe there would eventually be agreement on access to Parchin. Don’t panic on the bits in the document about laser enrichment or new enrichment sites. Although it hasn’t been discussed much, Iran’s previous efforts at laser enrichment of uranium (a separate technology from the centrifuge-based enrichment they currently employ) was known and appears to have been completely shut down in 2003 when all aspects of their nuclear work that could have weapons applications were shut down. Also, it is clear that the agreement only speaks of obtaining further clarification on already disclosed new enrichment facilities, so there is no disclosure of a previously unannounced facility. Note also that the agreement makes reference to a “step by step” process. This is somewhat of a slap to France and the US (and of course, Israel), because the Russians first proposed a plan they called a step by step process back in July of 2011. And, of course, the agreement is significant because by signing this agreement, the IAEA is getting ahead of the US and the rest of the P5+1 group despite the Wikileaks cable that described Amano as eager to do the bidding of the US while running the IAEA. There was no immediate indication that the killing had anything to do with Iran’s nuclear dispute with the West. https://www.emptywheel.net/wp-content/uploads/2016/07/Logo-Web.png 0 0 Jim White https://www.emptywheel.net/wp-content/uploads/2016/07/Logo-Web.png Jim White2013-11-11 10:15:532013-11-11 10:16:56Iran, IAEA Ink Agreement, But Was Slain Deputy Minister Part of P5+1 Negotiations? Yukiya Amano, Director General of the IAEA, appeared on the record yesterday at the Council on Foreign Relations. He presented a very brief statement and then the bulk of his time was spent in a wide-ranging question and answer session. The lineup of questioners included Barbara Slavin leading off, David Sanger near the middle and Gareth Porter getting in just before questioning was brought to a close. Notice the careful way in which Warrick has excerpted parts of what Amano said and inserted his own spin into the statements. If you listen carefully to what Amano says in response to Slavin’s question around the 27 minute mark of the video, you will see that Amano never characterizes the activities by Iran as sanitizing the site (as said in Warrick’s headline) or even that it was cleanup work, as Warrick says in the body of the article. Amano does mention removal of soil, demolition of buildings and extensive use of water, but maintains that access to the site is necessary in order to have a clear understanding of both past and current activities there. Amano sits in a a position of high tension. 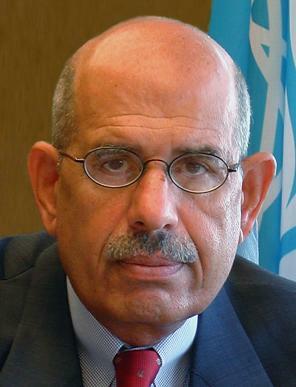 He must deal with the Wikileaks disclosures showing that he is much more aligned with the US than his predecessor, Mohamed ElBaradei. Perhaps helping him to navigate this delicate position, the host of the CFR event, George Perkovich of the Carnegie Endowment for International Peace, provided some background comments and posed questions to Amano aimed at allowing Amano to voice his overall goal of resolving issues diplomatically. Despite this claim by Amano that his goal is diplomatic solutions, he must deal with the fact that the issues his organization has been raising are cited (often in an embellished way, as Warrick does above) as grounds for an attack on Iran. Perkovich also used these comments as a way to provide an endorsement of sorts for a second term for Amano. As I noted on Thursday, the “sport” of predicting when Israel will attack Iran has now moved from the progressive blogosphere to many conventional news outlets. This week will see a major escalation in the anti-Iran rhetoric after the release of a much-anticipated report on Iran from the International Atomic Energy Agency. Many news outlets already are saying this report will be damning for Iran. Today, the Washington Post devotes front-page prominence to its “scoop” of details expected to be contained in the report. The title for the article, which seems meant to be read with breathless fear, is “IAEA says foreign expertise has brought Iran to threshold of nuclear capability”. Albright said IAEA officials, based on the totality of the evidence given to them, have concluded that Iran “has sufficient information to design and produce a workable implosion nuclear device” using highly enriched uranium as its fissile core. In the presentation, he described intelligence that points to a formalized and rigorous process for gaining all the necessary skills for weapons-building, using native talent as well as a generous helping of foreign expertise.